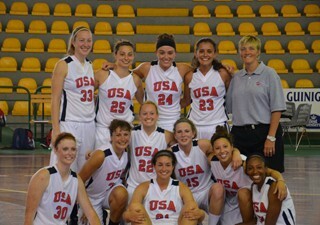 DETROIT - Wayne State University women's basketball student-athlete Paige Sickmiller competed for USA Athletes International during a trip to Italy last month. Below is a recap of what she and her teammates experienced while in Italy. Day 1: We arrived in Rome after a nine hour flight. Our first "tourist" stop was the famous Vatican where we saw the Pope as he said a blessing over everyone in the square outside of the Vatican. For dinner, I had a four-cheese lasagna with tiramisu. That evening we played our first game against Cus Roma and won 85-75 and I scored 25 points. Day 2: We visited the Colosseum in Rome along with the ruins of Ancient Rome, which included a guided tour through each. Our next stop was at the famous Trevi Fountain, where I made a wish. That evening we won again this time against San Rafiel (72-63) and I scored nine points. Day 3: Transferred to Tuscany. Stopped in Assisi, and saw the Basilica and Tomb of St. Francis. We shopped around the city and ate traditional Italian pizza and a canole. We stayed in town called Pescha in the region of Tuscany. That evening we played Pallacanestro Prato and won 90-45. I scored 18 points in the win. Day 4: We went to the beach, but it was cold and windy so we didn't stay long. Then went to the medieval town of Lucca to shop and eat. We played Lamurra Lucca and won 91-52 and I scored 20 points. Day 5: We visited a farm near Pescha and made our own traditional Italian pizza that we ate there. 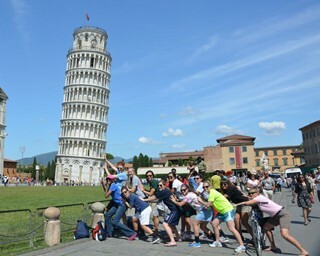 Our next stop was in Pisa, where we saw the Leaning Tower, the Cathedral and the Baptistery. We had lasagna and tiramisu for dinner. We had a great experience watching the Italy vs. Croatia soccer game outside of a bar near the University of Pisa. That night we lost, 66-60, to Ghezzano, the top team in their professional divison. I scored seven points. Day 6: We took the train to Florence, saw the museum of David and Michelangelo statues, along with the fourth biggest cathedral in the world. We ate a calzone bigger than my head. We spent most of the day shopping at leather goods stores, etc. Day 7: We bussed to Venice, with a stop in Verona for the day. We saw an old arena now used for operas and also saw the Romeo and Juliet balcony (balcony of the actual Capulet family). We shopped in Verona then finished the drive to Venice. Day 8: We went to Venice's famous glass factory, spent the day walking around the beautiful city and along the ocean.